Sometimes telling a story is easier than teaching. Jesus did it through parables, and parents tell stories to children to help them learn. I generally don’t read Christian fiction, but Second Story: seeing what’s not being saidwas filled with real life evangelistic situations, questions and conversations. 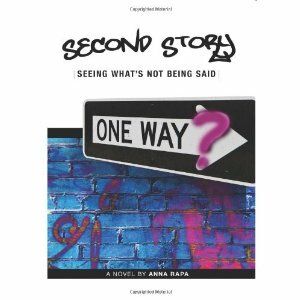 Anna Rappa does a great job in this blend of fiction and evangelism training in her book Second Story: seeing what’s not being said. The drama is in the conversation between the believable characters. I found myself identifying with all three main characters. They ask my questions, think my thoughts, and wrestle with the same ideas I turn in my head regarding methods of evangelism in a post-modern world. How do I reach people without being rude or pushy? How do I help a person move forward in their faith? How does doubt make my conversation more authentic? If you want to share your faith with your friends, but don’t want to be obnoxious, you’ll likely find Second Story: seeing what’s not being saida great read, even though the story doesn’t end. It doesn’t wrap up neatly but acknowledges the reality of the conversational journey. Alex Cunningham’s recent motorcycle accident changed his life – now he sees every day as a mission to share the good news of the gospel. But his long-time girlfriend, Annie Russo, just doesn’t understand. And if that isn’t enough, every time Alex opens his mouth to say something about God at work, everything backfires: his co-manager Drew rarely even looks at him now. But help comes in the form of Sara Locke, an ex-missionary widow with wisdom to spare. Together, Alex, Annie, and Sara discover how to see people’s unspoken emotional barriers to faith in God. Along the way, Alex and Annie explore how to engage those barriers in natural and nonjudgmental ways as they begin to talk about their Christian faith with their friends. But one of them has more success than the other, and the stress on their relationship might just be too much. A new blend of fiction and evangelism training, author Anna Rapa uses narrative storytelling to communicate key truths about evangelism in today’s postmodern world. Dive in to the story of Alex and Annie, and let this story show you how to reach people in today’s culture with God’s transforming story of rescue. Order your copy of Second Story: seeing what’s not being said from Amazon (affiliate link, throw me a nickel). Note: The author provided me a review copy.